If you are born under the right star, for example, and have power over the human mind as the moon over the sea, you might order the genocide of 100,000 Kurds and shuffle to the gallows with such arcane recalcitrance as to elicit, from even your harshest detractors, perverse, unspoken deference. Geraghty is one of the U.K.'s top neurosurgeons—and although, on one level, his words send a chill down the spine, on another they make perfect sense. Deep in the ghettoes of some of the brain's most dangerous neighborhoods, the psychopath is glimpsed as a lone and merciless predator, a solitary species of transient, deadly allure. No sooner is the word out than images of serial killers, rapists and mad, reclusive bombers come stalking down the sidewalks of our minds. But what if I were to paint you a different picture? What if I were to tell you that the arsonist who burns your house down might also, in a parallel universe, be the hero most likely to brave the flaming timbers of a crumbling, blazing building to seek out, and drag out, your loved ones? Or that the kid with a knife in the shadows at the back of the movie theater might well, in years to come, be wielding a rather different kind of knife at the back of a rather different kind of theater? Think of psychopathic traits as the dials on a studio mixing deck. If you turn all of them to max, you'll have a soundtrack that's no use to anyone. But if the soundtrack is graded, and some are up higher than others—such as fearlessness, focus, lack of empathy and mental toughness, for example—you may well have a surgeon who's a cut above the rest. Of course, surgery is just one instance where psychopathic “talent” may prove advantageous. There are others. In 2009, for instance, I decided to perform my own research to determine whether, if psychopaths were really better at decoding vulnerability (as had been found in some studies), there could be applications. There had to be ways in which, rather than being a drain on society, this ability actually conferred some benefit. And there had to be ways to study it. Enlightenment dawned when I met a friend at the airport. We all get a bit paranoid going through customs, I mused. Even when we're perfectly innocent. But imagine what it would feel like if we did have something to hide—and if an airport security officer were particularly good at picking up on that feeling? To find out, I decided to conduct an experiment. Thirty undergraduate students took part: half of them high on the Self-Report Psychopathy Scale, and half of them low. There were also five “associates.” The students' job was easy. They had to sit in a classroom and observe the associates' movements as they entered through one door and exited through another, traversing, en route, a small, elevated stage. But there was a catch. They also had to note who was “guilty”: Which one of the five was concealing a scarlet handkerchief? To raise the stakes and give the observers something to “go on,” the associate with the handkerchief was handed £100. If the jury decided that they were the guilty party—if, when the votes were counted, they came out on top—then they had to hand it back. If, on the other hand, they got away with it, and the finger of suspicion fell heavier on one of the others, they would, in contrast, stand to be rewarded. They would, instead, get to keep the £100. Which of the students would make the better “customs officers”? Would the psychopaths' predatory instincts prove reliable? Or would their nose for vulnerability let them down? More than 70 percent of those who scored high on the Self-Report Psychopathy Scale correctly picked out the handkerchief-smuggling associate, compared with just 30 percent of the low scorers. Zeroing in on weakness may well be part of a serial killer's tool kit. But it may also come in handy at the airport. Joshua Greene, a psychologist at Harvard University, has observed how psychopaths unscramble moral dilemmas. As I described in my 2011 book, Split-Second Persuasion, he has stumbled on something interesting. Far from being uniform, empathy is schizophrenic. There are two distinct varieties: hot and cold. A railway trolley is hurtling down a track. In its path are five people who are trapped on the line and cannot escape. Fortunately, you can flip a switch that will divert the trolley down a fork in the track away from the five people—but at a price. There is another person trapped down that fork, and the trolley will kill him or her instead. Should you hit the switch? Most of us experience little difficulty when deciding what to do in this situation. Although the prospect of flipping the switch isn't exactly a nice one, the utilitarian option—killing just the one person instead of five—represents the “least worst choice.” Right? As before, a railway trolley is speeding out of control down a track toward five people. But this time you are standing behind a very large stranger on a footbridge above the tracks. The only way to save the five people is to heave the stranger over. He will fall to a certain death. But his considerable girth will block the trolley, saving five lives. Question: Should you push him? Here you might say we're faced with a “real” dilemma. Although the score in lives is precisely the same as in the first example (five to one), playing the game makes us a little more circumspect and jittery. But why? Greene believes he has the answer. It has to do with different climatic regions in the brain. Case 1, he proposes, is what we might call an impersonal moral dilemma and involves those areas of the brain, the prefrontal cortex and posterior parietal cortex (in particular, the anterior paracingulate cortex, the temporal pole and the superior temporal sulcus), principally implicated in our objective experience of cold empathy: in reasoning and rational thought. Case 2, on the other hand, is what we might call a personal moral dilemma. It hammers on the door of the brain's emotion center, known as the amygdala—the circuit of hot empathy. Just like most normal members of the population, psychopaths make pretty short work of the dilemma presented in Case 1. Yet—and this is where the plot thickens—quite unlike normal people, they also make pretty short work of Case 2. Psychopaths, without batting an eye, are perfectly happy to chuck the fat guy over the side. To compound matters further, this difference in behavior is mirrored, rather distinctly, in the brain. The pattern of neural activation in both psychopaths and normal people is well matched on the presentation of impersonal moral dilemmas—but dramatically diverges when things get a bit more personal. Imagine that I were to pop you into a functional MRI machine and then present you with the two dilemmas. What would I observe as you went about negotiating their moral minefields? Just around the time that the nature of the dilemma crossed the border from impersonal to personal, I would see your amygdala and related brain circuits—your medial orbitofrontal cortex, for example—light up like a pinball machine. I would witness the moment, in other words, that emotion puts its money in the slot. But in a psychopath, I would see only darkness. The cavernous neural casino would be boarded up and derelict—the crossing from impersonal to personal would pass without any incident. The question of what it takes to succeed in a given profession, to deliver the goods and get the job done, is not all that difficult when it comes down to it. Alongside the dedicated skill set necessary to perform one's specific duties—in law, in business, in whatever field of endeavor you care to mention—exists a selection of traits that code for high achievement. In 2005 Belinda Board and Katarina Fritzon, then at the University of Surrey in England, conducted a survey to find out precisely what it was that made business leaders tick. What, they wanted to know, were the key facets of personality that separated those who turn left when boarding an airplane from those who turn right? Board and Fritzon took three groups—business managers, psychiatric patients and hospitalized criminals (those who were psychopathic and those suffering from other psychiatric illnesses)—and compared how they fared on a psychological profiling test. Their analysis revealed that a number of psychopathic attributes were actually more common in business leaders than in so-called disturbed criminals—attributes such as superficial charm, egocentricity, persuasiveness, lack of empathy, independence, and focus. The main difference between the groups was in the more “antisocial” aspects of the syndrome: the criminals' lawbreaking, physical aggression and impulsivity dials (to return to our analogy of earlier) were cranked up higher. Other studies seem to confirm the “mixing deck” picture: that the border between functional and dysfunctional psychopathy depends not on the presence of psychopathic attributes per se but rather on their levels and the way they are combined. Mehmet Mahmut and his colleagues at Macquarie University in Sydney have recently shown that patterns of brain dysfunction (specifically, patterns in orbitofrontal cortex functioning—the area of the brain that regulates the input of the emotions in decision making) observed in both criminal and noncriminal psychopaths, exhibit dimensional rather than discrete differences. This, Mahmut suggests, means that the two groups should not be viewed as qualitatively distinct populations but rather as occupying different positions on the same continuum. Their answers couldn't have been more insightful. CEO, spy, surgeon, politician, the military … they all popped up in the mix. Amongst serial killer, assassin and bank robber. Jon Moulton, one of London's most successful venture capitalists, agrees. In a recent interview with the Financial Times, he lists determination, curiosity and insensitivity as his three most valuable character traits. What “Psychopath” Means. Scott O. Lilienfeld and Hal Arkowitz in Scientific American Mind, Vol. 18, No. 6, pages 80–81; December 2007/January 2008. Inside the Mind of a Psychopath. 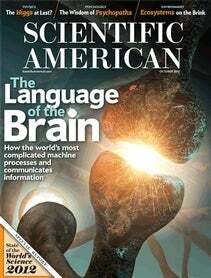 Kent A. Kiehl and Joshua W. Buckholtz in Scientific American Mind, Vol. 21, No. 4, pages 22–29; September/October 2010. Kevin Dutton is a research psychologist at the Calleva Research Center for Evolution and Human Sciences at Magdalen College, University of Oxford.